**A South African sweet dish consisting of shaped pieces of spicy dough that are fried in oil and then covered in a sweet liquid, often eaten at the end of a meal. Mix all ingredients together with warm water, dough must be very soft. Knead for 10 minutes using a little oil on your hands to stop from sticking, rub some oil over dough, cover with cloth and allow to rise for an hour or until double in size. Deflate dough and break off small pieces shaping and pulling into little oblong shapes and fry in oil on medium to high heat until brown. Fry 5 koeksisters at a time. 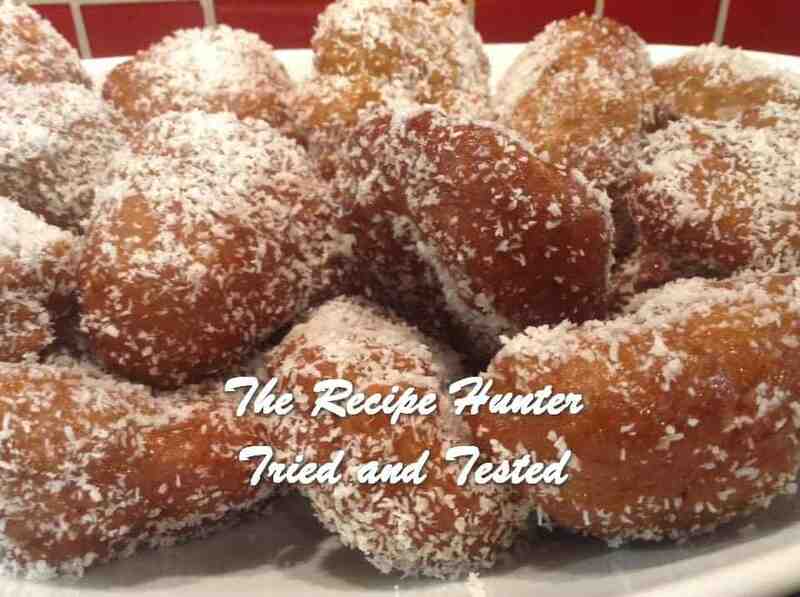 Glaze in sugar syrup and cover with coconut . Boil 3 cups sugar with 3 cups water and 5 cinnamon sticks for about 20 mins on medium heat, then simmer when sugaring the koeksisters. Soak in syrup for 1 min then transfer to a cooling rack. Nabs, thank you for your note, I will check in with Gail and ask her to clarify and get back to you once I hear from her. Hi, you can use AP Flour or plain flour. Here in South Africa we use cake flour. I therefore used cake flour. I adapted the recipe for use in other countries. Hi Nabs, the cooking time will all depend on the heat of the oil. I prefer it a light brown color, because once you dip it in the syrup it does tend to look darker. It does take time to get this one perfect. Just keep trying.